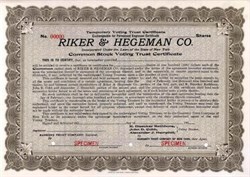 Beautifully engraved SPECIMEN certificate from the Riker & Hegeman Company. This historic document was printed by the American Banknote Company around 1910 and has an ornate border around it. In 1914, the Riker-Hegeman Corporation of New York was a drug store chain with 105 stores It was growing at the rate of more than three stores per month. The average druggist turned over theie inventory three or four times per year, while the Riker-Hegeman chain claimed twelve.